Hey, Wal-Mart, you don't own Black Friday! Kids hit the inflatable slides at Pump It Up, while parents load up on Black Friday deals. Many shoppers will get up at the crack of dawn on Black Friday just to grab doorbuster deals like $10 waffle makers and flatscreen TVs for under $200. But dragging the kids along that early can be, well, a drag. 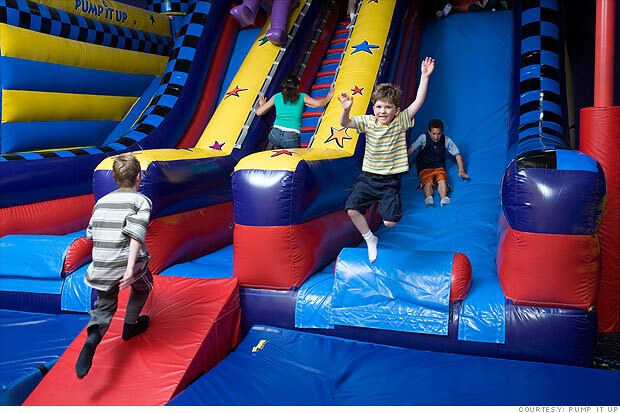 The nationwide franchise of kid-friendly recreation centers offers inflatable slides, bounce castles, houses and pizza parties. Four years ago, Pump It Up started Black Friday Drop & Shop events, which allowed shoppers to drop off their kids at a center for several hours while they did their shopping. "We entertained kids, did arts and crafts with them and served pizza," said Lee Knowlton, CEO of Pump It Up. "Our Black Friday sales jumped 30% to 40% [that year]," he said. "This is a great event for us and it also keeps the kids active and busy," he said. This year, Knowlton said 140 Pump It Up locations will hold the Black Friday Drop & Shop event nationwide. The price will vary regionally, but the range is $15 to $25 per child for three to four hours of fun-filled babysitting. Knowlton expects this year's Black Friday sales to increase 10% to 20% over last year. "The bookings are already looking good," he said. "We encourage parents to make reservations early because a couple of our locations have already sold out for the Black Friday event." Is this the next Snuggie? Fleece onesies for adults and slippers with flashlights are some of the wacky products hitting the market in time for the holidays.